The Sliding Ruler Method is an efficient, effective and fast way for Quilters to cut fabric. No special rulers or quilting notions are required. Most of the math has been done for you! 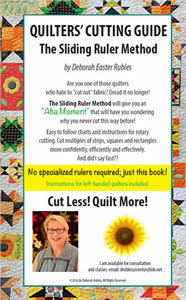 The book is written for both new and experienced quilters. Any quilter will benefit from using this method! SQUARE UP LEFT EDGE OF FABRIC. 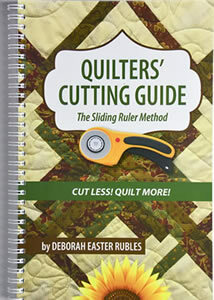 FLIP OPEN THE QUILTERS’ CUTTING GUIDE, The Sliding Ruler Method TO SIZE OF STRIP NEEDED. DETERMINE START PLACE OF RULER BASED ON NUMBER OF STRIPS NEEDED. PLACE RULER ON LEFT SQUARE EDGE OF FABRIC AT DETERMINED START PLACE. CUT FABRIC. SLIDE YOUR RULER FROM ONE NUMBER TO THE NEXT BASED ON THE CHART, CUTTING A STRIP EACH TIME. You need the book to cut your fabric! CQuilters' Cutting Guide" by JARick Productions. Shop owners: inquire about bulk orders here.